Rotterdam was practically erased in one day – May 14, 1940. After the war, massive reconstruction was planned. 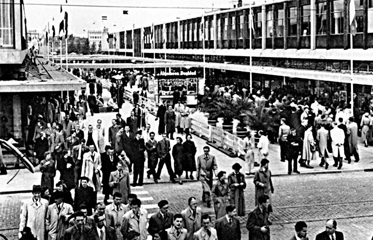 One of the major projects was the Lijnbaan shopping centre, by Van Der Broek and Bakema architects, which opened in 1953. This was Europe first traffic free shopping area. The weather protection and fine street furniture keep it pleasurable, alive and very modern to this day! As an architectural student I listened about this space but experiencing it was special. Modest and very elegant space with all the public urban space needs fulfilled. "The Lijnbaan was a fragment of the future built in a city that was desperate to evoke the spirit of times to come" [Evelyn Van Es]. This is what Lewis Mumford, famous urban theorist, has to say about Lijnbaan: "the unity and harmony of all this delight the eye, with just the right combination of the artful and the natural, the intimate detail and the clear over-all pattern". Black & white photo bellow was from 1955, short while after oppening.